Dhritarashtra said: O Sanjaya, after my sons and the sons of Pandu assembled in the place of pilgrimage at Kurukshetra, desiring to fight, what did they do? Bhagavad-gita is the widely read theistic science summarized in the Gita-mahatmya (Glorification of the Gita). There it says that one should read Bhagavad-gita very scrutinizingly with the help of a person who is a devotee of Sri Krishna and try to understand it without personally motivated interpretations. 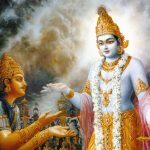 The example of clear understanding is there in the Bhagavad-gita itself, in the way the teaching is understood by Arjuna, who heard the Gita directly from the Lord. 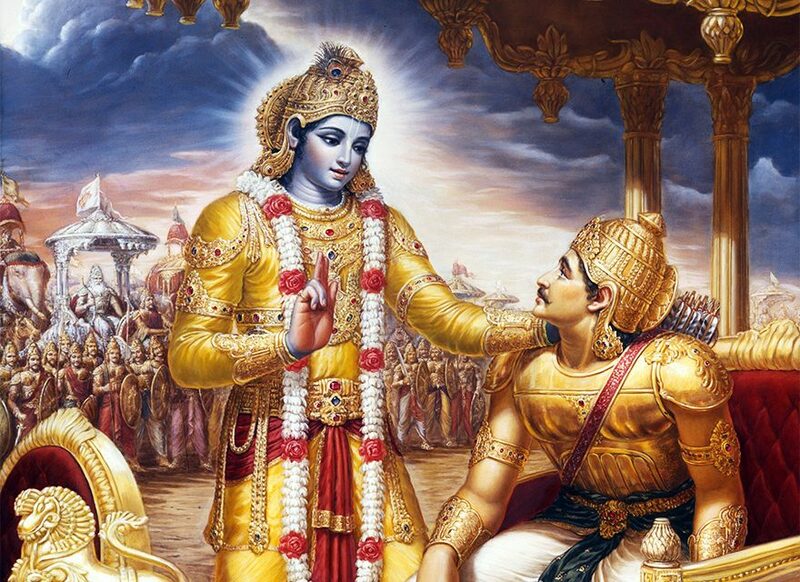 If someone is fortunate enough to understand Bhagavad-gita in that line of disciplic succession, without motivated interpretation, then he surpasses all studies of Vedic wisdom, and all scriptures of the world. One will find in the Bhagavad-gita all that is contained in other scriptures, but the reader will also find things which are not to be found elsewhere. That is the specific standard of the Gita. It is the perfect theistic science because it is directly spoken by the Supreme Personality of Godhead, Lord Sri Krishna. The topics discussed by Dhritarashtra and Sanjaya, as described in the Mahabharata, form the basic principle for this great philosophy. 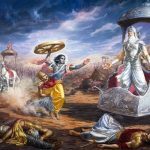 It is understood that this philosophy evolved on the Battlefield of Kurukshetra, which is a sacred place of pilgrimage from the immemorial time of the Vedic age. It was spoken by the Lord when He was present personally on this planet for the guidance of mankind. The word dharma-kshetra (a place where religious rituals are performed) is significant because, on the Battlefield of Kurukshetra, the Supreme Personality of Godhead was present on the side of Arjuna. Dhritarashtra, the father of the Kurus, was highly doubtful about the possibility of his sons’ ultimate victory. In his doubt, he inquired from his secretary Sanjaya, “What did they do?” He was confident that both his sons and the sons of his younger brother Pandu were assembled in that Field of Kurukshetra for a determined engagement of the war. Still, his inquiry is significant. He did not want a compromise between the cousins and brothers, and he wanted to be sure of the fate of his sons on the battlefield. Because the battle was arranged to be fought at Kurukshetra, which is mentioned elsewhere in the Vedas as a place of worship – even for the denizens of heaven – Dhritarashtra became very fearful about the influence of the holy place on the outcome of the battle. He knew very well that this would influence Arjuna and the sons of Pandu favorably, because by nature they were all virtuous. Sanjaya was a student of Vyasa, and therefore, by the mercy of Vyasa, Sanjaya was able to envision the Battlefield of Kurukshetra even while he was in the room of Dhritarashtra. And so, Dhritarashtra asked him about the situation on the battlefield. Both the Pandavas and the sons of Dhritarashtra belong to the same family, but Dhritarashtra’s mind is disclosed herein. He deliberately claimed only his sons as Kurus, and he separated the sons of Pandu from the family heritage. One can thus understand the specific position of Dhritarashtra in his relationship with his nephews, the sons of Pandu. As in the paddy field the unnecessary plants are taken out, so it is expected from the very beginning of these topics that in the religious field of Kurukshetra, where the father of religion, Sri Krishna, was present, the unwanted plants like Dhritarashtra’s son Duryodhana and others would be wiped out and the thoroughly religious persons, headed by Yudhishthira, would be established by the Lord. 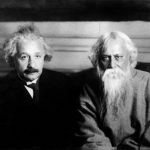 This is the significance of the words dharma-kshetre and kuru-kshetre, apart from their historical and Vedic importance. How did Arjuna become bewildered and fall into ignorance? The speaker of the Mahabharata, Vaisampayana, started explaining the topic to Janmejaya in the Bhisma Parva, with the following words. Externally, he desired to show Sanjaya that he would be relieved if this were so. Internally, however, he found it hard to restrain his depression, for if there was conciliation, then, it would be difficult for his sons to claim the kingdom. “As Bhisma, who is on our side cannot be defeated by Arjuna, it is better that we fight. Let that happen!” It was not suitable however to show such desires externally. There is a hidden meaning in the word ksetra (field) in the phrase dharma-ksetra. The field was a place for growing the grains of dharma, in the form of pious Yudhisthira along with his group, who was the very incarnation of dharma.1 The field, a place for exerting oneself in the work of cultivating, was the place in which Krishna, the nourisher of dharma, would encourage Yudhisthira. The field, a place for many projects like blocking irrigation dykes and watering, was the place where Krishna would assist Yudhisthira in many ways to establish the grains of dharma. The same field is also a place for weeds to grow. The weeds, enemies of the grains, in the form of Duryodhana and others, also grew there, but would be destroyed by Krishna. In this very first verse of Srimad Bhagavad-Gita beginning with dharma- ksetra-kuru-ksetra, avatar Krsna Dwaipayana Vyasadeva has used this narrative form: assembled in the place of righteousness Kuruksetra etc. ; to properly introduce the location, the action and the theme. Thereafter when King Dhritarastra in Hastinapura asks his minister, Sanjaya who had received clairvoyance by the grace of Vyasadeva as to what happened on the battlefield, Sanjaya related all the events exactly as they happened by having the clairvoyant ability to witness them directly within his mind as if he was there present. Srila Vyasadeva to properly introduce their dialogue begins with the narrative form with: having seen the army of the sons of Pandu etc. After this until the end of the chapter the subtle intricacies of duty are delineated. As has been stated in the ancient Vedic scriptures concerning the greatness of Srimad Bhagavad-Gita and that is the words that emanate from the transcendental mouth of the Supreme Lord Krishna when well assimilated precludes the necessity of various other scriptures. The Supreme Lord Krishna in order to mitigate Arjuna’s lamentation tells him that he grieves for that which is not worthy of sorrow in answer to the cause of Arjuna woes as has been described in the first chapter which began by the blind Dhrtarastra inquiring about his hoped for sons victory; yet internally in doubt due to Arjunas unsurpassable valour revealed in his aquisition of divine weapons by satisfying Shiva, also this was proved when Arjuna defeated the Gandharvas and released Duryodhana even though the latter had come to cause he and his brothers mischief, also by Arjunas removing of the Kauravas crowns and ornaments when he defeated them recapturing the cowherd of the king at the city of Virata. All these events flashed through Dhritarastra’s mind and with a heavy heart he asked Sanjaya who had been bequeathed with clairvoyance byVedavyasa giving him the capacity to envision everything that was happenning on the battlefield of Kuruksetra between the army of his sons the Kauravas and the army of the Pandavas. The Mahabharata records these events from a conversation between the holy sage Vaisampayana and Arjunas great-grandson Janamejaya and begins the Bhagavad-Gita with Dhritarastra spoke. In this very first verse the question is placed within the sentence thus: In the holy land of Kuruksetra what did my sons and the sons of Pandu desiring battle do? Kuruksetra is the place of the origin of dharma or righteousness. The Vedic scriptures declare that Kuruksetra is a place for performing sacrifice. Its signifigance is well known and recorded. All through the ages Kuruksetra has been a place for performing sacrifice, sacred and holy, resided at by the Brahma-rishis. Those who depart this world at Kuruksetra should not be grieved for under any circumstances. The suggested question that Dhritarastra is inwardly posing is whether or not his sons observing the powerful warriors in the enemy ranks such as the mighty Bhima and the intrepid Arjuna who is a perfect master in the use of celestial weapons, were still determined to fight or reconsidering did they give up all thoughts of warfare and instead call a truce and make a peace settlement. The phrase dharma-ksetra kuru-ksetra used by Dhritarastra signifies two things. The first is that he is inwardly thinking that his sons who are not righteous might give back the kingdom to the Pandavas which they appropriated by fraudulent means, due to being influenced by the righteousness and holy acts of sanctity performed in sacred sacrifice for the satisfaction of Bhrigu Muni and as well as the potent act of atonement performed by avatar Parasurama which He offered on five altars as expiation for his fathers death. The second is that Dhritarastra was contemplating that Kuruksetra being the the place where dharma originated is inherently powerfully potent in virtue and righteousness. If the Pandavas who are virtuous by nature, increase in righteousness due to contact with the holiness of Kuruksetra and thereby lose all desire in regaining the kingdom after duly weighing the sinful consequences of slaying their kinsman and relatives then I would be very pleased with them. Sri Sankaracharya did not comment on this sloka. The commentary starts from 2.10. Dharmaksetre etc. Here some [authors] offer a different explanation as : Kuruksetra : the man’s body is the ksetra i.e., the facilitator, of the kurus, i.e., the sense-organs. The same is the field of all wordly duties, since it is the cuse of their birth; which is also the field of the righteous act that has been described as : ‘This is the highest righteous act viz., to realise the Self by means of the Yogas’; and which is the protector [of the embodied Self] by achieving emancipation [by means of this], through the destruction of all duties. It is the location where there is the confrontation among all ksatras, the murderous ones-because the root ksad means ‘to kill’ – viz, passion and asceticism, wrath and forbearance, and others that stand in the mutual relationship of the slayer and the slain. Those that exist in it are the mamakas,-i.e., the intentions that are worthy of man of ignorance and are the products of ignorance-and those that are born of Pandu: i.e., the intentions, of which the soul is the very knowledge itself and which are worthy of persons of pure knowledge. What did they do? In other words, which were vanquished by what? Mamaka : a man of ignorance as he utters [always] ‘mine’. Pandu : the pure one. dhṛtarāṣṭraḥ uvāca — King Dhṛtarāṣṭra said; dharma-kṣetre — in the place of pilgrimage; kuru-kṣetre — in the place named Kurukṣetra; samavetāḥ — assembled; yuyutsavaḥ — desiring to fight; māmakāḥ — my party (sons); pāṇḍavāḥ — the sons of Pāṇḍu; ca — and; eva — certainly; kim — what; akurvata — did they do; sañjaya — O Sañjaya. Thank you so much for the side by side commentaries! Looking forward to seeing the full chapters in this format. Absolutely amazing. Read it twice already from the book and going 3rd time round online. Its highly inspirational,motivational,enriching,enlightening and beautiful. You can be in the worst possible situation but knowledge within this book will literally carry you through. Its magic. Its power. Its effects are rare. It takes you to another level. Its the 1st book that I would recommend any1 to read. of Gita for the university students . sree md vagbat gita is a world famous philosophical book .all should read it. thank you so much for the light of Krishna you have given to the regular girl. This may be one of the greatest things I have ever found on the internet. Much light and many blessings to you. The Karma you bring to your life to create this I can only imagine… You dwell in the Devine..Pranams my dear light fulled soul. could you just tell me which part of the Gita has to be read for a student who is leaving school.? as a teacher i would like to give them a gift for life from the Gita, please enlighten me as to the same. I found version translation is the best. I read it many times. who knows where is the link to order this book (used to have a link on the site)? I had another version of the book, not feel the translation as good as this one. It would be ideal If there is a kindle version of this translation. It is a commendable enterprise to spread the teachings of Gita. The Bhagavad Gita is a practical guide to righteous and successful living. Its main emphasis is on performing one’s duty well without attachment to fruits of action. All work is to be done in a spirit of dedication to God. Commentaries from enlightened saints / acharyas add to appreciation of the divine song. *Chapter2, slokas 47 and 48- tell us how to perform every task in life. *chapter4. sloka 38.- spells out the goal of life. *Chapter6. slokas 5 and 6-tell us that it is not somebody else who will guide us but it is one’s own jagrat buddhi or vivek that will raise us to higher levels of understanding. 2. A STUDENT(OF LIFE) IF HE STUDIES(reads and ponders over) GITA WITH CARE HE WILL FIND A TREASURE IN EACH SLOKA. 3. SUGGEST THAT YOU ADVISE EACH STUDENT TO KEEP A COPY OF THE BHAGWAT GITA WITH HIM AND STUDY AND PONDER OVER ONE OR MORE SLOKAS EACH MORNING. HE WILL FIND THAT THIS WILL HELP HIM REMAIN CALM AND REFLECTIVE THROUGHOUT THE DAY.HE WILL THEN ACT WITH INTELLIGENCE AND NOT JUST REACT TO PEOPLE AND CIRCUMSTANCES AS AN AVERAGE PERSON DOES. I find the literal translation of each word at the end of the commentaries most useful.One can then divine the meaning based on the level of vivek one has.Commentaries by others ,howsoever eloquent, can not reveal the true meaning of the sloka to a person for these are only a reflection of the understanding of the commentator. One’s own brain has to ponder over the words to fathom the meaning based on one’s intelligence. Dharma Kshetra symbolizes path of Rightelousness (Social-Religious and Spiritual). Kuru Kshetra (or Karma kshetra) symbolizes worldly activities of above three kinds) Dhrutaraashtra is Blind. So also we are also blind or ignorant to path of righteousness. Battlefield symbolises waging for victory. So also we are struggling in our life with hectic activities for peace and happiness. 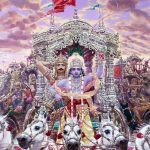 Sri Krishna has chosen battlefield to advise us to follow ‘Dharmic Parth’ inspite of our hectic activities of worldly life, and not to fulfill our sensual desires by its instincts. 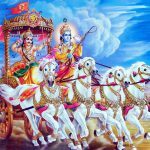 The essence of Gita is guidance of righteous path in Social-Religious-Spiritual aspects for which code of conduct differs. Inter-changing of code of conduct create mis-understanding in Society. That is the crux of the problem of code of conduct in a Society. Yoga, Vedaanta, Kundalini vidya, Gayatri vidya, and Sri Vidya. Hinduism and Religious matters. Note, He doesnt refer to them as an enemy. Does one go to a Battlefield and desire peace? Here the boys go to a holy place of pilgrimage desiring to fight.These openingly lines are the opening lines of such Irony- which also is theme of this yug. Earth is a holy place, created for us to accelerate our soul peacefully back to the source, yet we rebel and fight due to our ego,desires etc. Thank you very much for your kindness because of your website I can learn many subject of India and Hindu Dharma or Sanatana Dharma. As for young children Chapter 12…Bhakthi Yoga reading is good….Its one amoung the short chapters which – children can by-heart it too. Great work for those who really want to study and grasp Bhagvad Geeta. Commentaries by different great men is a great help to understand true meaning of every word and every verse. It is a great service to the humanity and deserves special blessings and grace of Lord Shri Krishna. Thank you so much for the collective efforts to bring out all the commentaries together in a way that is applicable. Just a small request, if possible you can do the same with Srimad Bhagavatam.